Hello, friends. My name is Alan Jackman and I’m from Sacramento. I’m a professional musician, songwriter and guitarist. The main thing you should know about me is that I’m a big fan of Buckethead. So in my blog I often mention him as a guitarist to admire and take example from. In the past, I used to make my living by working as a guitar teacher. Things have changed since then and today I decided to become a part of the crazy life of online-world. Today social media and blogging are a huge opportunity for everyone and ignoring it doesn’t make sense to me. 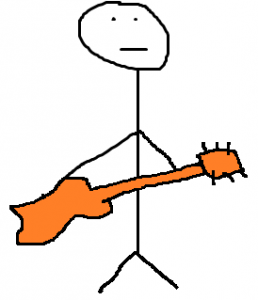 Instead of teaching a few people locally, I decided to start my own blog and share my knowledge with thousands of people on the web who are looking for help in learning the guitar. My goal is to provide high-quality content in a form of guitar lessons and tutorials. As a guitar teacher, I understand the most common problems and questions starters have. Therefore, my content will help you overcome these obstacles and successfully become a great guitar player. Thank you for coming to my blog. I hope you will find answers to all your questions. If not – make sure you leave a comment (I do answer them) or contact me on social media. I will gladly answer all your questions.